The beginnings of this cheat sheet began when I was in medical school, when I read a book my resident senior lent me, ECG made simple. As an academic teaching attending now, I am still teaching EKGs through this one-page cheat sheet! See my other posts for more EKG tips and resources. Of note, many resources have different definitions/criteria to diagnose certain parts of the ECG (ie. LVH). I chose what appeared to be the most common and the easiest for myself to remember. 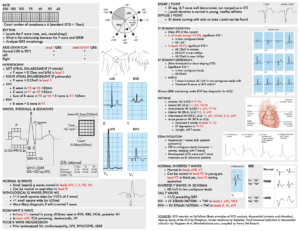 16 Responses to "ECG Cheat Sheet!" thanx Henry..I just want to know..how do u design a cheat sheet? You’re welcome! I think the easiest way to create a cheat sheet is using Microsoft Word or Pages for Mac (which I use). From there, you can create tables or text boxes with your information. Moreover, if you can screen capture images (Command ⌘-Shift-4 for Mac / Windows key + PrtScn for PC) from pdfs or online sources, you can add it to your cheat sheet. The hardest parts are 1) Choosing what high-yield info you want to include, 2) Laying out that info on a single page. I also find that as I learn more and more about a subject, my understanding as a whole of the subject deepens, and thus my cheat sheet will change accordingly. Thank you Henry for taking the time to share this organized, concise and helpful review ! When starting a study plan for our ECG exam, this helped so much on where to start/how to break it down. Many thanks and be well! You’re welcome Nancy! It’s humbling to see people finding it useful to learn! Thank you very much for such an illustrative and informative sheet. Thank you sooooo mUch ! The best 8 sheets I printed this year! Thank you so much for sharing the notes! Thank you so much! Your cheat sheets are perfect!! Thank you. Great teaching tool.